Ross Gardam Limited Edition Ora Desk Lamp and Silhouette Desk Lamp feature in the kitchen/living space of Baldasso Cortese’s Middle Park Residence. Retaining the heritage features of the exisiting double-fronted weatherboard, the architects have created a complementary contrast with the contemporary additions. The kitchen/living area is the hub of the home, filled with natural light from the surrounding courtyards and large skylights. 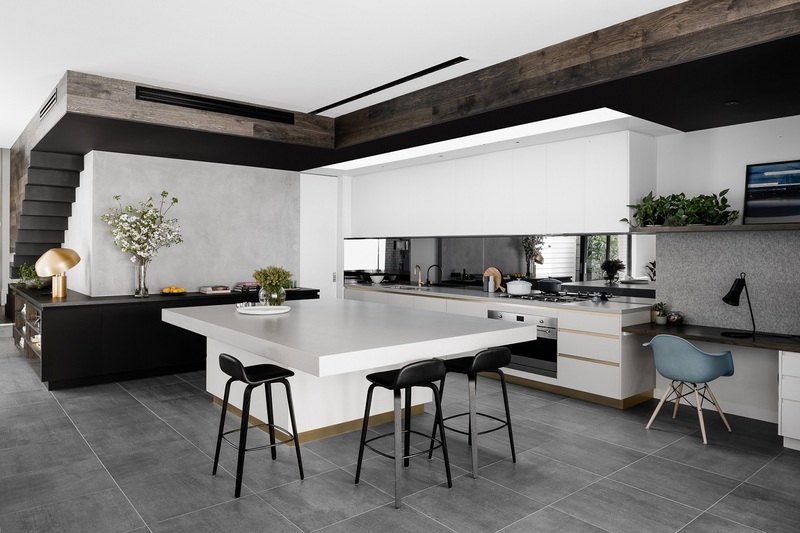 With a request to not include a dining table, the family are able to gather around the central cantilevered island to share meals and entertain. The space features contrasting white and black laminate, as well as concrete-look bench tops and brass detailing. To keep with the sleek style of the space all appliances are concealed and a reflective splash back ensures contact between the kitchen and living area is maintained.